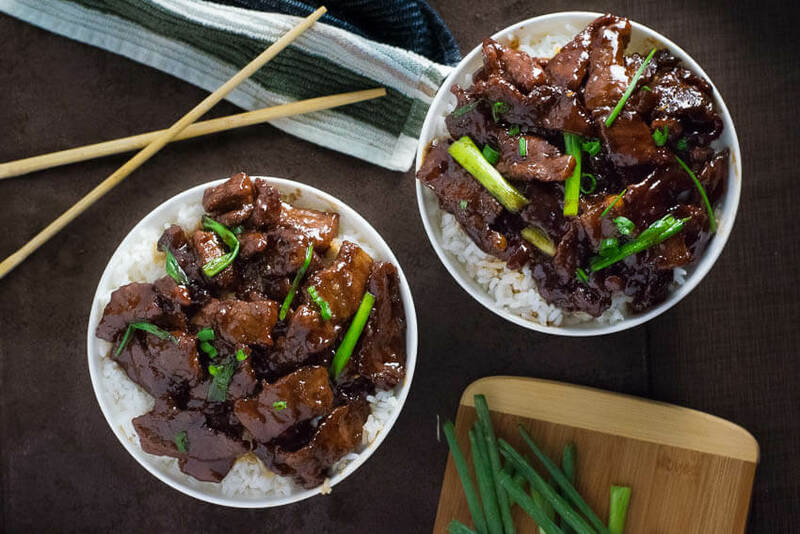 This sweet and sticky Mongolian Beef recipe is as good as any restaurant’s! Enjoy it at home without the cost of eating out! I recall, years back, when I first started enjoying Asian food I was happily nomming down on some Mongolian Beef and stopped for a moment to contemplate how the restaurant got that great texture encapsulating each piece of sliced beef. The flavors were intoxicating, the texture was entrancing, and I was perplexed. In the end, I just chalked it up to voodoo and happily went about munching on my meal. Fast forward a number of years, and I now know a thing or two about cooking, and have decided to tackle this Asian food classic for myself! And oh man am I happy I did! This recipe is every bit as good as anything I’ve ever ordered in a restaurant, and it is one of those meals that give you an irreplaceable sense of satisfaction after you cook it. Plus, the waiters always look at me funny when I wander into the kitchen looking for seconds. Thinly sliced flank steak, cut against the grain, is the best steak for Mongolian Beef. This cut is reasonably priced, tender when cut against the grain, and perfect for slicing thin. The wide flat cuts have a lot of surface area to form a great crust while searing. 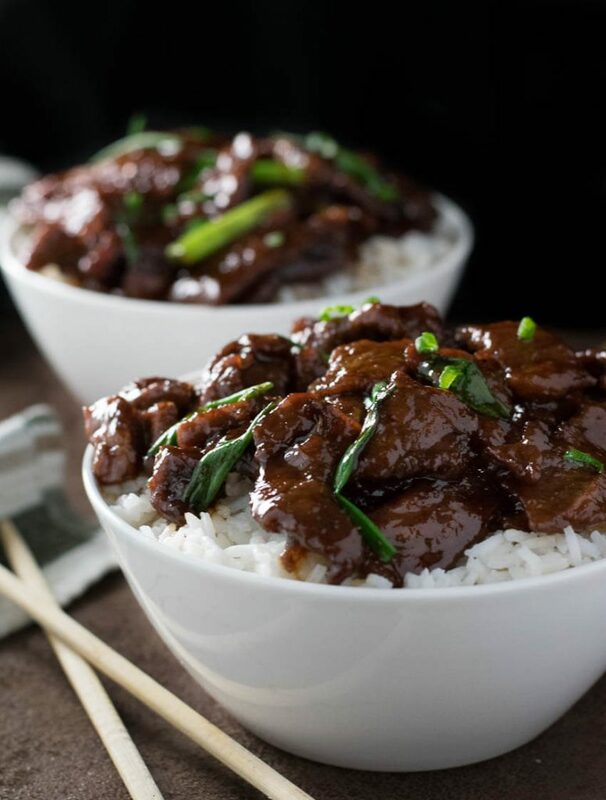 To make Mongolian Beef you prepare your thinly sliced steak by coating it in cornstarch. This adds a wonderful texture to the final dish. The meat is then sauteed in oil to brown. Don’t worry if the interior of the meat isn’t cooked through when it has sufficiently browned. It will finish cooking with the sauce. The most important thing to remember about the sauce is it will thicken as it cooks. If it is too thin for your tastes, simply cook it longer. If it is too thick, just add a little moisture back into the pan. 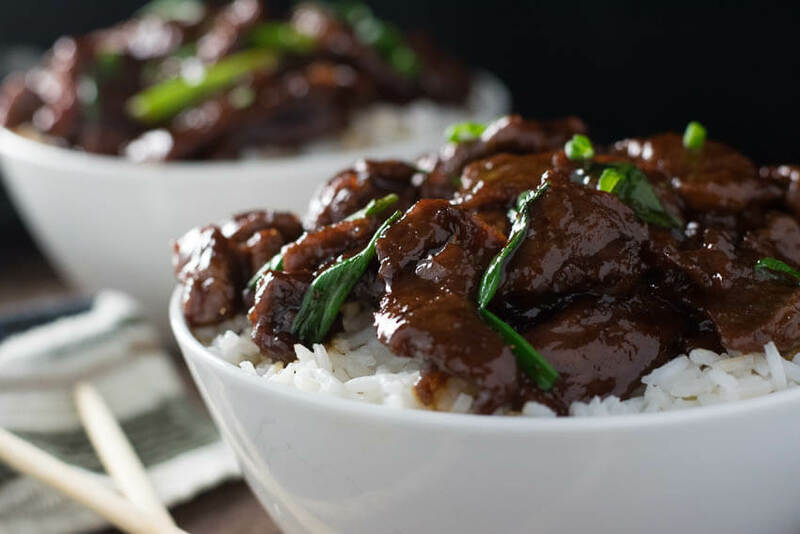 This Mongolian Beef recipe is as good as any restaurant you will eat at! Enjoy it at home without the cost of eating out! Heat 2 tsp of oil in a saucepan over medium/low heat and add ginger, garlic, and then soy sauce and water. Next add the brown sugar and stir it in till it is fully dissolved and raise the heat to medium and boil the sauce until it thickens then remove the sauce from heat. Slice the steak thinly into 1/4" slices, cutting against the grain. Once steak has been cut toss the pieces in cornstarch to ensure both sides are evenly coated. Let rest for 10 minutes to ensure the cornstarch fully adheres. While the steak is resting heat 1 cup of oil in a wok or 12" skillet over medium heat until it is hot. Saute the beef in the oil for 3 minutes or until the beef is starting to brown. Don't worry if the beef is not cooked through yet. Using a slotted spoon remove the beef from the skillet and pour oil out. Place the pan back over the heat and add the beef back in and add the sauce as well. Cook for 2 minutes, stirring frequently, and then add the green onions. Cook for an additional minute then remove the beef and onions with a large spoon onto a serving place, leaving excess sauce in the pan. 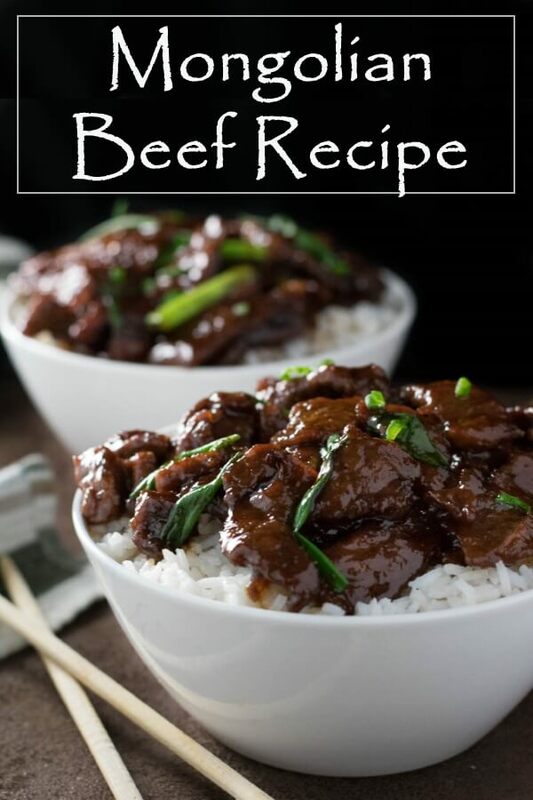 IF YOU LIKED THIS RECIPE check out my Korean BBQ Beef Stir Fry too! This recipe was originally published on FoxValleyFoodie.com Nov 11, 2015. 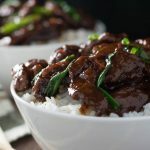 If you enjoyed reading my Mongolian Beef recipe then you should probably like me on Facebook and follow me on Pinterest too. That’s what I would do at least, because if you don’t get to know me but you still use my recipe it is kind of like taking candy from a stranger, and your mom taught you not to do that. Don’t disobey your mom, subscribe to Fox Valley Foodie today. What a wonderful, simple recipe. I love the hint of crunchiness around each piece of beef, and am happy to learn the secret! Pinned it for later, but this is one pin I won’t forget about! Yep – I need to make this! And soon. Looks delicious! Agreed! I’m starting the timer! I made this for dinner and it was great! Really enjoyed how easy it was and the sauce thickened up much better than I expected. However, the recipe calls for 1/2 cup of water but never uses it in the directions, I just threw it in with the soy sauce and it worked out fine but I’m curious about that mysterious ingredient! Overall great recipe, definitely adding it to my own personal cookbook. Thank you so much for commenting! I left that out just to see if you were paying attention! jk Seriously though, finding incomplete recipes online has always been a pet peeve of mine. You were correct to add the water at the same time as the soy sauce and I have updated the recipe to reflect that! I grew up in the Fox Valley of Chicago area. Same? Fantastic! I’m glad you like it! I’m just a few hours north – Fox Valley, Wisconsin! Fox Valley Foodie, thank you for your blog post.Really thank you! Awesome. This is fantastic! I was thinking of adding green pepper, but wasn’t sure if I should brown it with the meat? Otherwise, prepared exactly as you stated. Thanks for sharing this great recipe !!! I made this recipe two days in a row. The first night, it was good, but both my wife and I thought the soy sauce was a bit strong, kind of an after taste. We both needed plenty of white rice to cut through that bit of harshness. The second night, I made with LIGHT soy sauce, and it was perfect. No strong harshness. We loved it! I will continue to prepare this way in the future. ooh I am going to make that this weekend.